Need protection from Intruders?? Here’s a solution. Place your important files and folders in any drives and hide the entire drive!!! 1) Right click on My Computer and click on Manage. 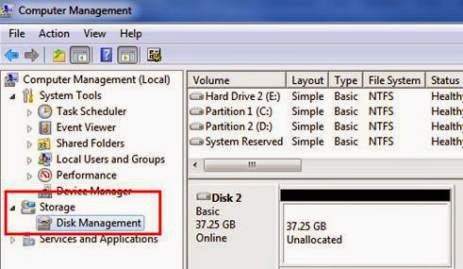 2) A computer management tab opens and the left side options , you’ll see an option named Disk management under Storage. Click on it. 3) There you’ll be able to see all your hard disk drives. Right click on the drive you wish to hide and click on the option Change drive Letter and Paths. 4)Click on Remove and press OK. Your Drive is now safely HIDDEN !! 1) Go to the same Disk management option, right click on the drive you have hidden , goto the option Change drive Letter and Paths , press add and click OK. It has RETURNED !!! Cool ain’t it ?? !! !